Helping new authors find readers and helping readers find new authors. John “Sicarius” Gaines has been regarded as the best at what he does. He is a paid assassin, and he is ruthless. He will stop at nothing to complete any contract he is given. He receives a contract for the death of New York Governor Tim Patton and completes it quickly and efficiently. As the heat from the Governor’s death begins to trickle out, Sicarius finds himself entangled in an international drug-smuggling operation, of which the Governor was a key member. Russian crime lord Kirill Krishnov soon learns of the blow to his drug empire from the Governor’s death and retaliates with full force. Sicarius must not only fight for his own life but for the life of everyone who is dear to him. Sicarius is a clever thriller with a protagonist who brings a darkness to the role of ‘hero’ that makes this story a real page turner. It’s a story you’ll recognize but it’s well written and fast paced. You’ll become captivated by the explosive narrative and the violence surrounding the hitman, John ‘Sicarius’ Gaines. You’ll also enjoy the political ramifications of Americans working with Russians. It’s very astute in this regard considering the current Administration’s problems. The punchy narrative style really suits this type of hard-boiled thriller and the pace builds to a grand crescendo you’d like to see in a Bond movie. There’s depth and emotional intelligence which prevents the woman in his life from being there just to add a glamorous touch and when she’s threatened his reaction is suitably grandiose and gratuitous. It’s the twists and turns of this story that’ll really set it a part from others in this genre. The subtle political threats woven through the basic thriller, that reflect an undercurrent in modern America that novelists see, even if the politicians don’t. This is what set’s Sicarius above its contemporary fellows, the exploration into the dark heart of American politics, using the lens of an anti hero hitman. 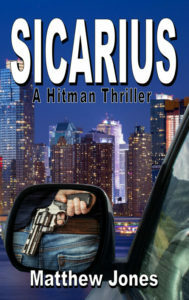 In conclusion, if you enjoy a good, racy, well-written thriller with lots of action, page turning events, and a heart, then Sicarius is for you. Book Blogger is created for independent authors, self published authors, new authors contracted to large publishers and all first time authors looking to spread the word about their new book. When self publishing it is often difficult to find reputable places in which to publicise your book. The literary press are generally not interested in new authors and book publicists are not a cheap way of promoting your new book. Often new authors ask how can I promote my new book for free? It is possible to find cheap or free ways to promote a new book but mostly these places are ignored by readers, literary agents or publishers as self promotion and most literary agents and publishers are already swamped with book promotion offers while readers are increasingly making their selection of new books from book blogger websites or book review websites. Following the book review debacle on Amazon many readers have now lost faith in the review system and view with suspicion the five star ratings that fill the pages of an unknown author. All this make it very difficult for a new author to promote a book and find somebody willing to review a first novel. We created Book Blogger to help authors and readers find each other. A place where genuine reviews are given and where a reader can have confidence when choosing a new book to read.